The California Air Resources Board has unanimously approved sweeping new rules designed to facilitate the transition from gasoline-powered to electric and hydrogen-powered cars. By 2025, automakers are now required to produce 1.4 million “zero-emission” vehicles for the California market, a number that would make clean cars 15 percent of all new car and truck sales. A Nissan all-electric Leaf in San Francisco. The rules also require automakers, by 2025, to halve greenhouse gas emissions emanating from vehicle tailpipes, compared to current levels. The federal Environmental Protection Agency is considering similar emissions rules, as well as a new fuel economy standard of 54.5 mpg by 2025. State regulators hope the new rules will lead to the widespread adoption of zero-emission vehicles, which they say is critical for meeting California’s goal of cutting greenhouse gas emissions 80% by 2050. That goal was established by executive order by Gov. Arnold Schwarzenneger, and goes beyond the cuts mandated by California’s landmark global warming law, AB 32. According to the board’s calculations, zero-emission vehicles will have to make up nearly 100% of new car sales in 2040 and beyond to meet that goal. “Without [the transition from gasoline to clean cars], which may appear to be radical to people, you cannot lower CO2 emissions enough to stop the global climate change that’s occurring,” says Tom Cackette of the Air Resources Board. The Air Resources Board estimates that the new rules will raise the average sticker price on 2025 model year cars by $1900. However, the board says, the savings in fuel costs over the life of the car will be three times that. The rules cut greenhouse gas emissions from tailpipes 47% by 2025 compared to today’s new cars. Today’s cars are 99% cleaner than cars were in the 1960s. But the new rules reduce smog-forming emissions from tailpipes a further 75% by 2025. Beginning in 2018, automakers must sell increasing numbers of electric cars, hydrogen fuel-cell cars or other cars emitting little to no pollution. By 2025, zero-emission vehicles must make up 15% of new car sales. In the early years of the program, car companies can get credit for plug-in hybrid car sales or for going above and beyond requirements of the greenhouse gas rule. The rules would require gas stations to install hydrogen fueling pumps based on the number of hydrogen fuel-cell cars in the state. The oil companies are negotiating with ARB on a Memorandum of Agreement that would allow them to avoid regulation if they build hydrogen stations with government or private funding. As for the response from the car industry, at a public meeting this week automakers asked for maximum flexibility in meeting the new sales mandate. They say success will ultimately depend on consumer adoption of the new technology, which includes cars like the all-electric Nissan Leaf and the Chevy Volt plug-in hybrid. Of the 10,000 Leafs sold in the US, almost 4,500 of them were sold in California. “It’s a long, long bridge between here and 2025 to grow 15 percent of the market on a car that’s not price competitive, on a car that’s not performance competitive, on a car that will inevitably have infrastructure issues,” says Bill Reinert with Toyota’s Advanced Technology Group. The board didn’t address electric charging infrastructure in these rules, but has committed to looking at the issue in 2014. 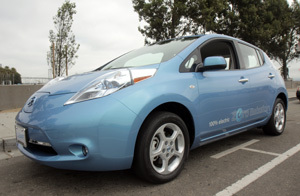 Currently, there are about 1,200 public charging stations in California and funding exists for several thousand more. Since electric vehicle owners charge their cars predominantly at home, regulators say they aren’t sure how many public charging stations will be needed. The Air Resources Board says it’s committed to continuing financial incentives for advanced vehicles, though the program has proven so popular that they have been reduced. Today, consumers can get a $2500 rebate for purchasing a zero-emission vehicle and $1500 for a plug-in hybrid, down from $5000 originally. “We can’t give an assurance that [the funding] will last through the year, so we’re looking at other alternatives,” says Tom Cackette of ARB. (For more on what it’s like to buy and drive an electric car, check out QUEST’s blog series Life with the Leaf). Good to see initiatives like this. However I am disappointed in the fact that there is no mandate to install EV chargers; by contrast oil companies have to install Hydrogen facilities at their gas stations at 1-2 million dollars per station. For 2 million dollars an oil company could outfit 33 gas stations with rapid charging stations at a cost of $60,000 each. Wouldn’t that be a better use of the money? 11-year-old Jamie Hullihen anticipated all evening.